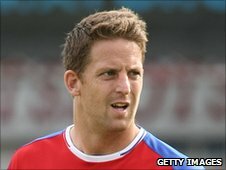 Aldershot Town manager Dean Holdsworth has named two captains for the coming League Two campaign. Right-back Ben Herd, 26, will skipper the first team while 27-year-old centre-half Darren Jones has been named club captain. Herd told BBC Surrey: "It's an honour and a privilege to be asked to be captain. I'm looking forward to leading the lads out. "Everybody is hungry and wants success. We're all striving for the same thing." He continued: "There is a great team spirit and hopefully we can achieve something together." Jones added: "I'm glad the gaffer chose us and I'm sure we can work together. "We've got as good a chance as anyone in the league. We've all got trust in Dean and we all think we can do really well." The Shots start the season away to Bradford City on Saturday.